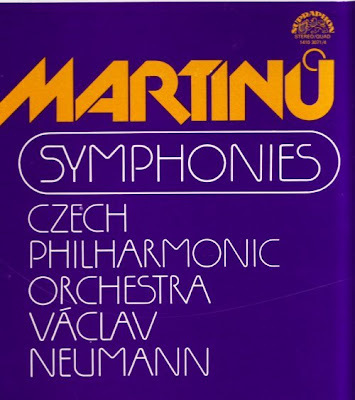 Above is the box design for the 1980 LP release of Supraphon's Martinů Symphonies, which I wrote about recently. The gorgeous typography is by Miroslav Jiránek. It, literally, graphically reminds us of what we lost when the CD replaced the LP. This Sunday Nov 4 I will be playing Martinů's Fourth Symphony on my Future Radio programme at 5.00pm UK time. Preceeding it will be another Czech rarity, Krystof Harant's Missa quinis vocibus. This dates from the early seventeenth century, and the exuberant performance by the Prague Madrigalists directed by Miroslav Venhoda should not invoke the silence detector. The Harant Mass is a mid-price Supraphon re-release. The recording was made in 1971 for LP release, and Miroslav Venhoda died in 1987. The early recording date, which predates much early music scholarship, probably explains why the musicians sound as though they are really enjoying themselves. The CD inlay by Jan Alton Design is below. This very well illustrates the compromises dictated by the CD format. The Harant design does its job. The Martinů could be out of the Museum of Modern Art. Graphics matter, which is why this book is important. Both about the Martinu, and about the elusive Mr. Belohlavek. Yes we are just running a mono stream, to reduce the audio complexity a little and ensure a continuous upload can be sustained at our end. It would be nice to run a higher bit rate stream, but due to contention ratios and the like we found it was hard to maintain and became frustrating for listeners!